There are many ways to enjoy Civil War Franklin and the related battlefield sites. A popular way is to spend one full-day and just hit the more popular sites, i.e., the three historic homes. This is an ideal tour if you like the docent-experience and you want more of a template-approach to a tour. 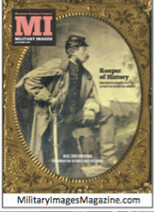 Here is a Franklin – 1 Day – Value Ticket (PDF) of how to do Civil War Franklin in one day. If you have the time, perhaps you’re in town for the weekend or a few days, and you’re interested in a more personalized or custom approach – and you want to get your Civil War geek on – then you will want to engage me (Kraig McNutt) as your Civil War guide, to custom-design and deliver a very personal and off-the-beaten-path approach to Civil War Franklin. The old gymnasium [see pic] immediately north of the Carter house is gone. Now you will a find pristine open field, a little over two acres, and the ability to imagine what it was like for Opdycke’s brigade to be in the reserve position and racing up the hill and south toward the Carter house to stem the tide of the Confederate’s who broke through the line. The Lovell property [see pic], the two structures immediately south (including the floral shop) of the Carter out-buildings are gone. That whole area, a little over an acre, is some of the most hallowed ground that could’ve ever been recovered. Now, we can walk upon that ground and offer a much more authentic interpretation of what happened when the Confederate brigades of Gordon and Strahl slammed into the first Federal line, smashing into the 50th Ohio as they pushed the Bluecoats back and into the lap of the 44th Missouri just a short distance behind them. The Domino’s strip mall is gone [see pic]! This 2.5 acre plot now is rid of the deplorable strip mall that had defiled this hallowed ground for decades. You can now walk uppn the very ground where the 100th Ohio, the 6th Ohio battery, and the 104th Ohio defended the Federal line just east of the pike as they faced the onslaught from Cockrell, Granbury, and Govan’s Confederate brigades. The foundation of the original Carter cotton gin has been uncovered and can be viewed as can the original Federal line which is outlined by a modern gravel-trench line. Have you seen the four acres that have been preserved called Loring’s Advance [see photo gallery]? Loring’s division came across this ground on their way to assaulting the far left Federal flank. Many boys from Mississippi, Alabama, and Arkansas traced their final steps upon this ground. And almost forgotten, but very vital to the Franklin story, is Fort Granger [see link and pics]. Though it has been preserved for decades now, many have not been able to appreciate its contribution to the Franklin story until recently with the uncovering – with confidence – of knowing which Federal troops constructed Fort Granger from March thru May in 1863. My personal, custom tours are booked in half-day (four hours), or full-day modules (eight hours). I spend time with you via email or on the phone discussing your interests, needs, and background to help design the perfect tour for you and your guests. These tours can range from $175 on up, depending on what you want and how many are in your group. Discounts are available (ask how to get $200 off). Here are the modules (four-hour experiences) I offer. You can choose one or up to all four. Module #1 – The Confederate Assault from Winstead to Carter Hill. We start at Winstead Hill and make our way north toward the Carter House, stopping on the way at the Federal forward line where Lane and Conrad saddled the pike. From there we make our way a little north to the Cotton gin site and then walk over to the Carter grounds. Module #2 – The Downtown area including field hospitals, headquarters and residences. There are several downtown area sites that are worth considering placing on one module (four hours). They include extant field hospitals (residences churches, buildings), the Harpeth River, the burnt out Harpeth River wagon bridge, the Lotz House (outside only), Schofield’s headquarters, the courthouse, the Rebel Sentinel monument, the Nashville-Decatur Railroad, etc. This is a great module to do by electric bike (extra fee). Module #3 – Eastern Flank, Carnton grounds, and the McGavock Confederate Cemetery. We will spend all our time on the so-called Eastern flank (i.e., the Federal left flank, the CSA right flank). There is ample preserved battlefield to walk (or bike) along paved paths. The key here is to understand Loring’s CSA advance upon this ground as the battle unfolded from 4-5 pm. We can also stroll the original Carnton grounds which served as a field hospital. Module #4 – Off-the-Beaten-Path: Fort Granger, Rest Haven, Harlinsdale, the Harpeth River, the Railroad Depot, etc. Most veterans of the Franklin battlefield have not even taken the time to examine some of the key stops in this module. We hit numerous sites in this module that help transform the Franklin Civil War experience from a flat 2-D perspective, to 3-D in high-def! Single modules (of four hour lengths) can be booked in the evenings, including weekdays, from 4-8 pm. I can cover two modules (eight hours) on weekends (Sat or Sun). Most people secure their tour time-slot way in advance (a year in some cases) by making a deposit. 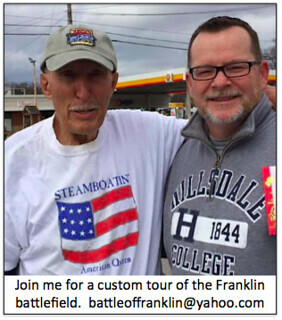 If you’re interested in a custom Franklin battlefield tour second-to-none, then “Franklin Civil War Tours” is just for you! My corporate training is sourced and/or inspired by programs like Dale Carnegie, Dave Ramsey’s EntreLeadership, Stephen Covey’s 7 Habits, and the U.S. Army war College’s Staff leadership Rides, and other top-flight leadership programs. Here’s some feedback from recent happy customers. fort as well a placements of redans and their significance. The appropriate end of the tour was at McGavock Cemetery where I was able to pay tribute to the men with marked graves that served in the same company as my ancestor. The details Kraig provides, and the time he takes to tailor a tour to your interests, is time well spent. I had previously visited Franklin and missed key details on generic visits. Kraig’s tour was a gift. It has energized me to become involved in restoration of the battle of Franklin.